The 2018 season of the Indian Premier League, also known as IPL 11, will be the eleventh season of the IPL, a professional Twenty 20 cricket league established by the BCCI in 2007. 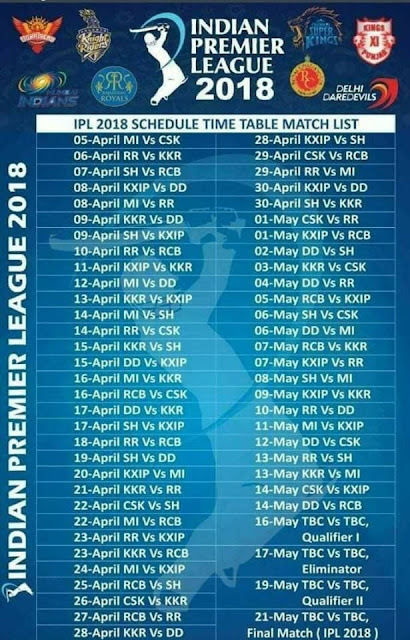 The season, which will be held from 7 April to 27 May, will see the return of the Chennai Super Kings and the Rajasthan Royals after serving two years of suspension for the involvement of their respective owners in the 2013 IPL betting case. This would be the first season with DRS. Star Sports purchased the media rights at ₹16,347.5 crore ($2.55 billion) for five years starting from 2018.